Bienvenidos… Welcome to the tropics. We knew you were coming so we turned up the heat. So take off those layers and forget about those snow shovels and enjoy this Pura Vida weather. Whether you are here to relax at our many wonderful restaurants, explore our National parks, fish, surf our beaches, zip line through the sky, raft our cool rivers, or a nice sunset cocktail. This magazine can be your guide to the best this area has to offer. Marina Pez Vela will be hosting the 7th Annual Quepos Billfish Cup (March 14-17). In addition to a fleet of boats, fantastic tours, spectacular restaurants, and air conditioned shopping, it is also home of Gelateria Amorosi so cool down with some of the area’s most delicious Italian Gelato and treats. Tell them we sent you, our advertisers love to hear it. Don’t miss Movie Night Under the Stars every Friday on the big screen ( schedule on Page 44) a wonderful night for the entire family. March Madness is upon us. So you basketball fans can catch all the action and great food at Sancho’s or Jolly Roger on the mountain or Double Hook Sports Bar at the Marina. Semana Santa is one of the busiest weeks here at the beach so have patience, relax and enjoy the celebration… Happy Easter. We want to thank Casper Homewood for the chillin’ at the beach cover (don’t forget your SUNBLOCK). 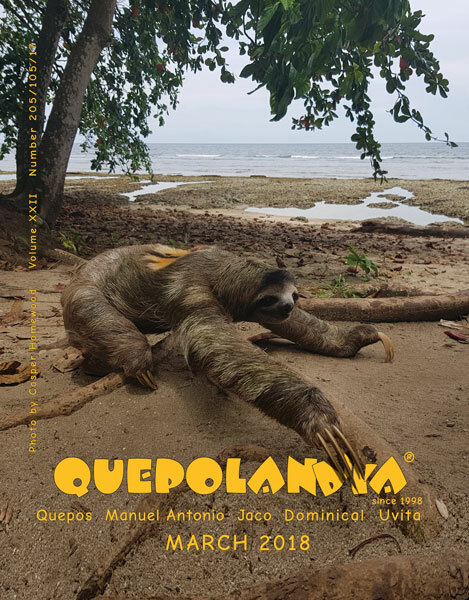 We are always looking for great shots for the cover so please send your photos to info@quepolandia.com for future consideration. We hope you enjoy our magazine and it helps guide you through this enchanting paradise we call home. You can always follow and share us here or facebook.com/quepolandia. We appreciate and welcome your comments.